When describing Cardiff Foreshore it’s best to use the term 'beach' advisedly. For Cardiff Foreshore is the ugliest, uninviting, awkward and certainly the most uninspiring rat-infested place you can go for a good day out. Shoe-horned between the industrial sprawl of Cardiff docks and the thickly coloured, swift flowing waters of the upper reaches of the Bristol Channel, the coastline looks like the outskirts of an Iraqi town paid a courtesy visit by the US air force. The smashed concrete slabs and girders, tangled steelwork and the general detritus is all that's left of a once profitable, productive and now long lamented industrial age. Put bluntly, the place is a bloody mess. So why aren't anglers advised to head further west where the beaches don't look like a war zone? Or even the numerous mud and peat venues to the east, marks that might be messy to fish but at least they do resemble a more natural environment? Often I advise sea anglers to make the effort to visit a new mark at low water before attempting to fish it, so that the inter-tidal topography and fish-holding features, such as sand bars, gullies and mussel beds, can be pinpointed and snags located. Cardiff Foreshore extends from The Gut, a small stream that runs onto the beach near the roundabout on Rover Way nearest to the docks entrance, westwards for approximately a mile and a half, almost as far as the Cardiff Bay Barrage. "It is possible to fish at the foreshore for approximately three hours over high water on all sizes of tides," advises Clive Vedmore, one of the area's most experienced match anglers, "though mid-range to spring tides are by far the most productive. "The problem with fishing smaller neap tides is that only a few marks are easily fishable and these can become congested, especially when the word is out that the fish are running. "I have to admit that anglers capable of presenting their baits at range will often have the advantage," says Clive, "but as long as you can cast a baited rig between 60-90 yards you'll catch fish. 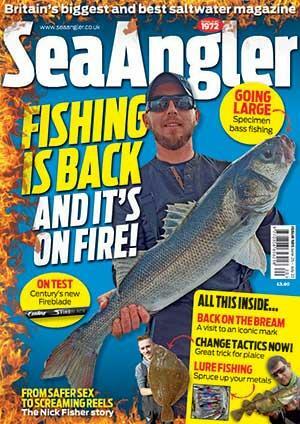 "Quite often the biggest cod, which includes doubles, are caught by anglers fishing very close in. Daytime fishing can be very good, but often more fish are caught at night," he advises. A brace of Cardiff Foreshore codling for Gary Parsons. A wide variety of species can be caught with cod top of the list and the first codling appearing by early September. Sport generally peaks late autumn/early winter, but in recent years there have been plenty of fish around until well into the spring. Whiting fishing throughout the autumn can be warm work and I once watched former world champion Jimmy Jones amass an impressive haul of over 50 sizeable whiting during a four-hour match here. This season the whiting haven't shown. The foreshore is noted for conger eels, with plenty of fish into low double-figures and even an occasional 20-pounder from spring to autumn; winter too if conditions remain mild. Other species include silver eels, bass, flounders, mullet and occasional plaice and soles. Interestingly, dogfish were rarely caught east of Penarth, but these days they are common. Many local anglers, including Clive, feel this is because the nearby Cardiff Bay Barrage and the second Severn Crossing have changed conditions, which suit other types of fish. For example, vast areas of foreshore, areas that used to comprise entirely of rock and hard ground, are now covered by soft mud that in places is up to a foot thick. Codling are the attraction for Nigel Davies, at Cardiff Foreshore. Bait should be dictated by target species. If it's cod you want, then fresh or frozen black lug, fresh blow lug and ragworms, squid and peeler crabs either fi shed individually or as a cocktail are killers. Frozen mackerel is number one for whiting, while congers can be caught on most bait with squid and mackerel being especially effective. Worm baits and peeler crab are tops for flatfish and bass. Aren't you lucky? The foreshore doggies clean up everything. If you are ace at mini shark snatching then I suggest you fish with fish bait or squid. Personally I can't really see the point. Single and twin snood paternosters work well, with most anglers using a twin-hook 2/0 to 4/0 Pennell to carry large baits for cod and congers. If congers are your thing, you would be well advised to beef up the hooklengths. Heavy mono or even wire would be a wise choice for this. The swiftly-flowing run of tide demands the use of 5oz or 6oz spiked leads with the mark fishable in most weather conditions, but winds with an easterly aspect will kick up a choppy sea and actually tend to be the least productive. Lug, squid and crab mounted on a Pennell rig is perfect here. The easiest way to the foreshore is to leave the A48, Eastern Avenue, at the Cardiff Docks/City Centre exit at Llanedeyrn. Follow the signs for Cardiff Docks, first along Southern Way then Rover Way. The dock entrance is just past the steelworks. Parking is restricted because access to the docks is not allowed unless fishing a prearranged open match. Park on the approach road near to the security gates and walk past the heliport to reach the foreshore.